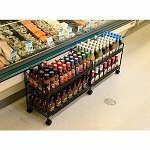 3 Way Rolling Grid Display makes great use of floor space in your location and even smaller spots that you thought were just wasted space. You can fill this rolling grid display with merchandise of a wide variety, such as candy, garment accessories and other novelty items. This freestanding floor fixture measures approximately two-foot wide by six-feet high. The wire grid panels sit atop a metal base with easy to move casters attached. This 3 way display can be moved with great ease to any spot in your store and customers can even rotate to check out items on the other side. Select your color of choice between black, white and chrome. The chrome fixture is slightly higher in price. You will love this wholesale grid display, so order it today at Candy Concepts Inc. and fill it up.